Sullivan: "I am unable to set the piece Gilbert persists in presenting." Gilbert: "The piece I persist in presenting, Sullivan, has substantially altered each time, otherwise there'd be little point in my presenting it to you." Sullivan: "With great respect, old chap, it has not substantially altered at all. You seem merely to have grafted onto the first act the tantalizing suggestion that we are to be in the realms of human emotion and probability, only to disappoint us by reverting to your familiar world of topsy-turvydom." Gilbert: "That which I have grafted onto act one, sir, has been specifically at your request. But if you take exception to topsy-turvydom, you take exception to a great deal of my work of the past 25 years, not to mention much of what you and I have written together since Eighteen-hundred-and-Seventy-one." Many a time popular artists have longed to create something that they felt was more important, more timeless, than the fluff they considered to be less important. This phenomenon is examined in detail in Mike Leigh's 1999 film Topsy-Turvy, about the troubled artistic partnership of Gilbert & Sullivan.The irony of course comes in when the "fluff" is remembered and the "important" work is completely forgotten. While one might suspect at first blush that a biopic of a composer and lyricist of operettas in the 1880's might not be terribly compelling, Leigh has in fact created an excellent portrait of these two very different creators and their struggles to both follow their own creative bents and to honor their business commitments to turn out a new show. This basic dilemma is given an additional twist when Sir Arthur Sullivan (Allan Corduner), at the time considered the greatest English composer, decides that he wants to write a grand opera. This desire finds expression in his angrily refusing to set William Schwenk Gilbert's libretti, which he finds increasingly repetitive and ludicrous. 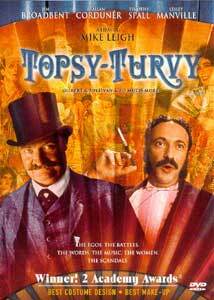 These libretti tended to center on some magical contrivance of one kind or another, hence the reference to "topsy-turvydom" in the quote above and in the film's title. Gilbert (a delightful Jim Broadbent) is naturally annoyed at this superior attitude, and exercising his own ego, refuses to write a different libretto. A chance visit by Gilbert, at the urging of his long-suffering wife Lucy (Leslie Manville), to an exhibition of Japanese life, gives the inspiration for one of the team's most notable productions, The Mikado. The second half of the film is concerned with their efforts to get this production staged, despite the many obstacles to such a different piece winning acceptance. The film does tend to be a little self-indulgent at times; its running time of over two and one half hours is not entirely devoted to necessary material. For instance, an early scene displays Gilbert's doddering, half-mad, whimpering father, who is never seen or heard from again. Ditto for Sullivan's Parisian womanizing, which goes on far longer than is necessary to get the picture. However, the performances by the leads are such a joy that it's hard to fault Leigh for including additional scenes. At the same time, the film frustratingly minimizes Gilbert expressing his novel idea to Sullivan and attempting to win him over to this innovative subject matter. This would have seemed to me to be the point where all of the first-act development was going, and it mostly happens off-screen. The costume design (which won an Oscar®) and the production design are first-rate and sumptuous throughout. The picture compositions are always interesting as are the emendations and arrangements of Gilbert & Sullivan's various compositions, taken largely from Princess Ida and The Sorcerer as well as The Mikado. The film excels in the scenes between the two principals, but the supporting performances are all superlative (with the possible exception of Charles Simon as Gilbert's half-dotty father). In particular, the backstage jitters and problems of producing a musical comedy are captured vividly and with both sympathy and heart. Anyone who has any sort of love for theater will be captivated by this picture. And fans of Gilbert & Sullivan will also be pleased with the music, for in most cases each song is performed in its entirety. Image Transfer Review: The anamorphic picture is clear throughout, although occasionally a little soft. Most of the time, an enormous amount of detail may be seen in the costumes and set dressings. The red-bathed excerpts from The Sorcerer tend to be a little bit oversaturated, but otherwise the color is natural and beautiful throughout. Occasionally this is to the detriment of the film, such as in one of the scenes in D'Oyly Carte's office, where I was transfixed by the vibrant green and orange stained glass in the window. Blacks are solid and rich, and shadow detail is excellent. See, for instance, the scene where Gilbert is speaking to his wife, who is in a canopied bed; the pattern of the shadowed fabric on the far side can be made out clearly. A beautiful transfer; it would be a solid 'A' if not for the red saturation issue. Audio Transfer Review: Both a Dolby Surround and a DD 5.1 track are provided. The DD track is marginally clearer, but both are quite good. Dialogue tends to be very much center-oriented, with the only surround activity coming from the music. I didn't notice anything coming from the subwoofer. Dialogue is natural-sounding and the music has excellent range. Really the only drawback seems to be that when the surrounds are not being used, there is a slight amount of hiss audible from them. However, under normal viewing circumstances this should not be an irritation. Extras Review: The centerpiece extra is a brief (five-minute) featurette, mostly devoted to Leigh's eccentric improvised/tightly scripted filmmaking style. It is, however, interesting, and it is astonishing to see Broadbent and Corduner out of their Victorian makeup and costumes. Given the brief content here, it would have been truly wonderful to have a full-length commentary and I regret that one wasn't recorded for this release. A trailer and five TV spots are included; they are all in very nice condition, as is to be expected for such a recent film. Bios of Gilbert and Sullivan are provided, as well as bios and filmographies for Broadbent, Corduner and Leigh. Several dozen stills and behind-the-scenes photos are included in a gallery, thoughtfully windowboxed. We also get subtitles in English, which is essential for following the rapid-fire delivery of Gilbert's lyrics, as well as in Spanish and French. A very witty and enjoyable film which I heartily recommend. The audio and video transfers are quite good, although the extras are a little disappointing.